Scrapped 4 May 1939 at Hendrik-Ido-Ambacht, The Netherlands. 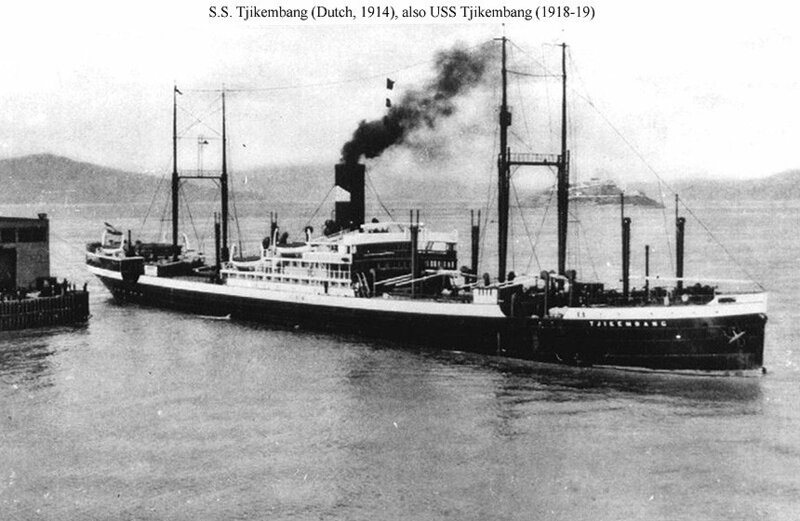 Depth of hold 31' 2"
Dictionary of American Naval Fighting Ships: Tjikembang—a freighter completed in early 1914 at Flushing, Holland, by Koninklijke Maatachappij de Schelde and owned and operated under the Dutch flag by the Java-China-Japan Line—was laid up in the Philippine Islands early in World War I. Seized by American customs officials soon after the United States entered the conflict, the ship was taken over by the Navy from the United States Shipping Board on 22 March 1918 and commissioned on 12 April. 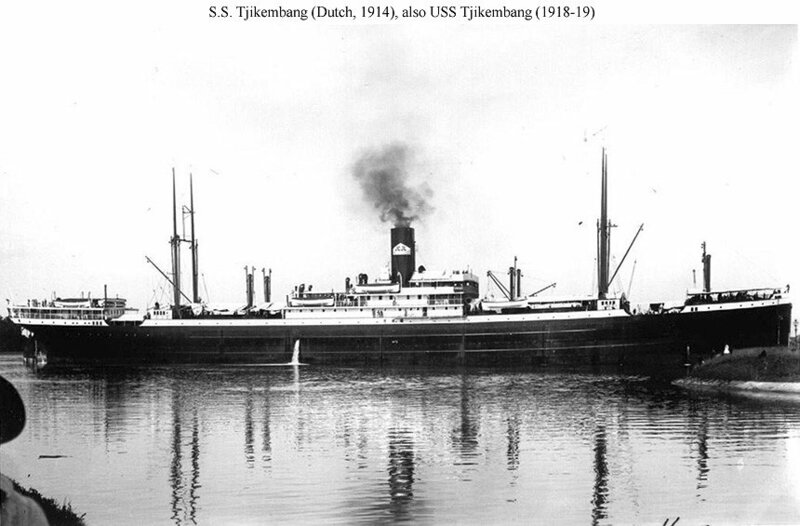 Assigned to the Naval Overseas Transportation Service, Tjikembang took on a cargo of hemp and sugar and then got underway on 11 May, bound for the east coast of the United States. After proceeding via the Hawaiian Islands and the Panama Canal, she arrived at New York City on 28 July. There, she unloaded her cargo picked up 7,410 tons of Army supplies, and sailed on 9 August in a convoy bound for France. She reached St. Nazaire on the 28th, discharged her cargo, and departed the European continent in a homeward-bound convoy on 14 September. After returning to New York on the 28th, she underwent extensive repairs and modifications which converted her to an animal transport. Upon completion of the yard work at the Robbins Drydock Co., the ship loaded 3,296 tons of general cargo, and a number of horses and mules. She got underway with a convoy for France on 27 October and reached La Pallice on 15 November, four days after the armistice ended hostilities. After discharging her cargo, the ship set her course for the Virginia capes on the 28th and reached Norfolk, Va., on 15 December. She underwent repairs there which lasted until 19 January 1919. On that day, she sailed for New York where she arrived on the 23d and was decommissioned on 22 February. After eight months of being laid up in reserve there, the ship was returned to the Shipping Board on 22 October 1919.